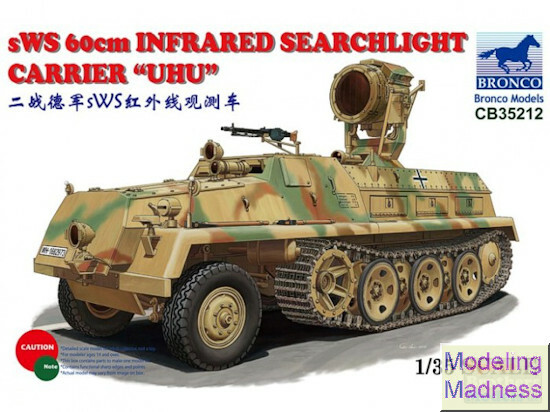 Among the modifications made to this vehicle was one where it carried an 60cm Infrared Searchlight. In such a role it was the 'illuminator' for IR detector Panthers. This variant of the sWS was heavily armored as was the norm for these late war vehicles. Just how many were so modified is unknown. When I opened the box, the sprues looked rather familiar. Sure enough, when comparing these to the Great Wall kit that was released several years ago, I noted that they were identical with one exception. The kit has excellent molding and is packed with bagged sprues all within yet another bag for protection. The tan plastic is devoid of any molding glitches I could see. The kit is quite light on photo-etch, which will please those that don't like working with it. 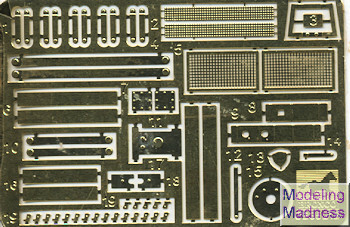 What pieces are included are limited to some detail bits and pieces that would be too fine in plastic. There is an upgrade p.e. set available for those that want to add it. It has a nicely formed one-piece hull into which the suspension tubes are inserted. The main tires are made up of several layers of tread that are glued together to provide realistic tread depth and basically eliminates the mold seam on the front tires/wheels. Of course, it also makes each one of these a small nine piece model in its own right. As it is an open vehicle, the interior is complete and nicely done. Everything you'd see by standing outside is included and there are a lot of parts. The instructions show that the engine covers can be displayed open, and here is where the difference between this and the GWH boxing comes into play. Bronco has provided a superbly molded engine to fit under the hood. 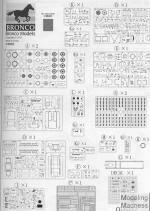 This takes into account the additional sprue provided. The searchlight and mount take up a considerable number of parts. This is where the big pieces of photo-etch go as they are what are used for the shutters on the light. The mount is also superbly detailed and is placed on a plate that sits atop the cargo compartment of the half-track. The links for the track are separate and it seems they simply snap togeth er, but I'll bet they need to be glued to stay that way. 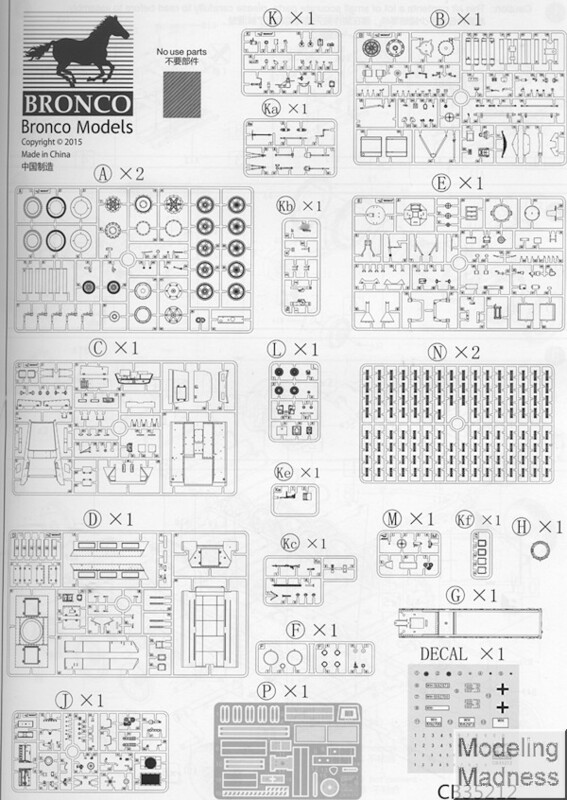 Instructions are very well done and as with other Bronco kits, provides clear construction steps with detail drawings and areas in color. This is particularly nice when it comes to installing the photo etch. Most color information is saved for the full color exterior painting guide with a five view of the vehicle. Some info is provided for things like the pioneer tools, but not for the engine which I have to guess would be black or unpainted steel. Color references are for Gunze paints. The small decal sheet is for one vehicle; that one shown on the box art. 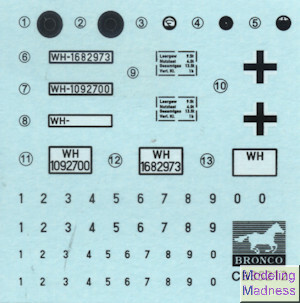 Decals are nicely printed and offer two ready to go plate options plus blanks and separate numbers for a third. Instrument decals are also provided. Overall, this looks to be an excellent kit. The subject is a bit on the different side, but with so many vehicles covered by other companies, it was probably difficult to find something that would be interesting and German for their first large size kit. I think they found a good match.